Crete has a rich heritage in the art of ceramics, dating back some 12,000 years and passing from generation to generation up to present day. 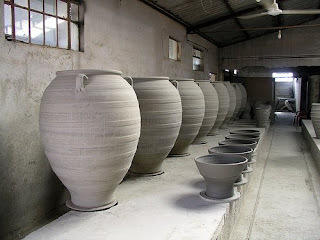 Four Cretan villages are famous for pottery and ceramics: Kentri, Thrapsano, Margarites and Nochia. Thrapsano, 25 km South East of Heraklion has around 1,000 inhabitants of whom approximately 26 are potters today, although over half of the population there has some links to the art. Thrapsano is located at an altitude of 340 m in the province of Pediada in the Heraklion prefecture, some 30 km south-east of Heraklion. Thrapsano is identified with its pottery and particularly with the crafting of large-sized ceramic storage jars called pitharia, a basic storage facility in Crete from the Minoan era to this very day. The name Thrapsano also relates to pottery and derives most probably from the verbs "thravo" (break) and "psino" (bake), since many vessels broke during the baking process. The name Thrapsana comes from ‘thrapsala,’ which translates as potsherds. Today the village is synonymous with pottery, particularly very large pots or urns called pitharia and it is here that Cretan Terracotta sources most of its products. Thrapsano potters follow in the footsteps of their Minoan ancestors, observing traditional materials, forms and manufacturing techniques.